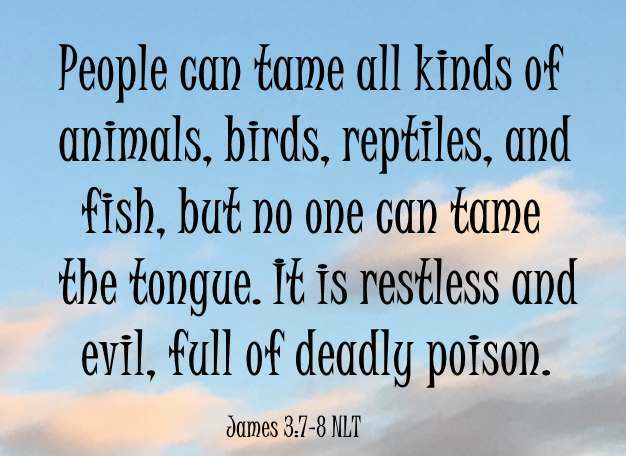 People can tame all kinds of animals, birds, reptiles, and fish, but no one can tame the tongue. It is restless and evil, full of deadly poison (James 3:7-8 NLT). For I can do everything through Christ, who gives me strength (Phil 4:13 NLT). That is why we need to seek the Lord, asking Him to help tame our tongues. I don't think there is any better way to tame our tongues then to pray the Word of God to help us do just that. Oh Lord, I am a person that desires to live a long and prosperous life (Psalm 34:12 NLT), so please help me keep my tongue from evil and my lips from telling lies (Psalm 34:13 NLT), for Your word says “Those who control their tongue will have a long life, opening your mouth can ruin everything" (Proverbs 13:3 NLT). Lord, help me turn away from evil and do good; searching for peace and maintaining it (Psalm 34:14 NLT) for I know You watch over those who do right; and that Your ears are open to cries for help (Psalm 34:15 NLT). I am crying out for Your help right now Lord. Lord Jesus, help me never use foul or abusive language and let everything I say be good and helpful, so that my words will be an encouragement to those who hear them (Eph 4:29 NLT) and help me get rid of all bitterness, rage, anger, harsh words, and slander, as well as all types of evil behavior (Eph 4:31 NLT). Instead Lord help me to be kind and tender-hearted and help me forgive others as You have forgiven me (Eph 4:32 NLT). Help me do all this as I do not want to grieve the Holy Spirit (Eph 4:30 NLT). May the words of my mouth and the meditation of my heart be pleasing to You Jesus, my rock and my redeemer (Psalm 19:14 NLT). Lord, let my conversation be gracious and attractive so that I will have the right response for everyone (Colossians 4:6 NLT). 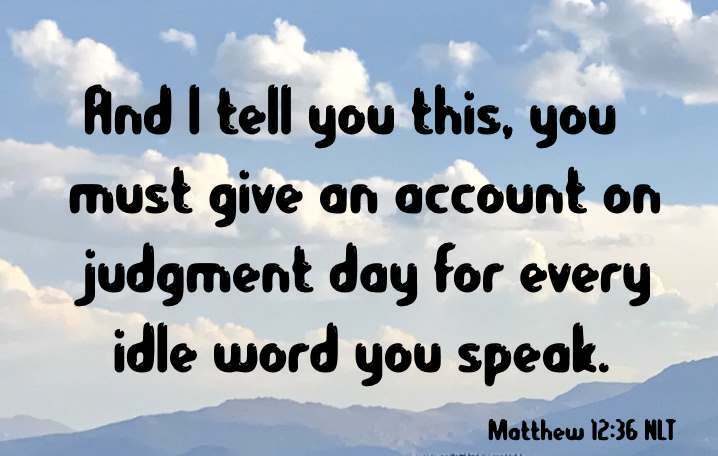 Lord, help me lead a blameless life and do what is right, always speaking the truth from a sincere heart (Psalm 15:2 NLT) and never gossip or harm my neighbors and speak evil of my friends (Psalm 15:3 NLT), knowing that I must give an account on judgment day for every idle word that I speak (Matt 12:36 NLT). Jesus, I need Your help doing these things so that I may enter into Your presence (Psalm 15:1 NLT). Also Lord, keep me from having a perverted heart that plots evil that constantly stirs up trouble (Proverbs 6:14 NLT). Instead I pray that I can be a person that produces good things from a good heart (Luke 6:45 NLT), so help me always fix my thoughts on what is true, and honorable, and right, and pure, and lovely, and admirable; thinking about things that are excellent and worthy of praise (Philippians 4:8 NLT). It will be obvious where my heart is because like You admonish, "what I say flows from what is in my heart" (Luke 6:45). Lord I know that I am not perfect and will not always be able to control my tongue (James 3:2 NLT). When that happens, Lord help me always say that I am sorry and ask for forgiveness as you have admonished us to do (Matthew 5:24 NLT). In the name of Jesus Christ, I pray God that You do whatever is necessary to tame my tongue!